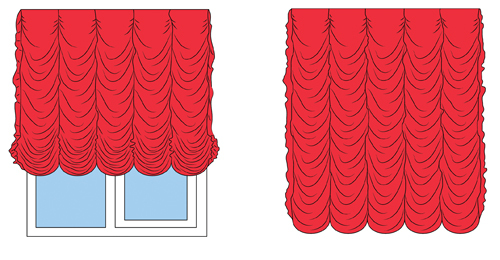 Window treatment trends have come and gone over the decades. After three generations in the business, we’ve seen it all! There is always a new trend when it comes to home décor and that includes window treatments, but the classics always come back. You have likely had various window treatments over the years, and knowing what is available today, as well as what was popular in the past can help you find the look you want for your home. These types of shades have fabric which gathers horizontally in a semicircular draping pattern, referred to as festoons, from the bottom to the top. These were extremely popular throughout Europe, particularly within Royal palaces throughout the 18th century. This decorative board that appears above curtains is typically upholstered and slightly padded. Its original purpose was as a decorative piece for beds in place of a headboard but moved to windows in the 15th century. 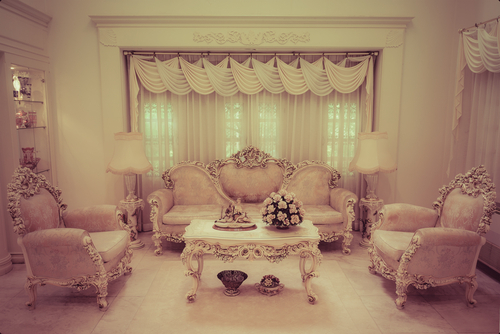 The decorative nature makes it an extremely formal window décor piece. Pelmets have made a comeback several times throughout the centuries, and can still be found in homes with more traditional style. Swags and tails are traditional and formal. These curtains were extremely popular throughout the early 1900s. Depending upon how they are hung, there may be a single swag draped over the curtain rod, or there may be multiple layers of fabric. In some instances, they are complemented with decorative braids or fringes, called tails. 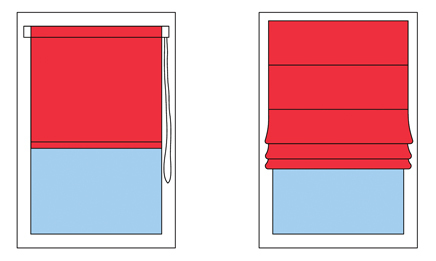 Roman shades were actually invented several thousand years ago in Rome, which is how they got their name. These shades offer an elegant and uncluttered aesthetic. This window treatment is made up of a flat piece of fabric that is lifted up with strings and rods. It forms horizontal folds and can be made from a variety of different materials. Window shades and draperies have been part of interior décor for centuries. Often, it isn’t the window treatment itself that changes, but the style, fabric, and colors. Metallics were extremely popular during the latter half of the 18th century and were a way to show regality. Heavy brocade curtains were the main window treatment choice during the early 19th century and are becoming popular once again, complete with silk ties to hold back the draperies to allow natural light into the room. Throughout the 1940s and 1950s, neutral patterns and muted solid colors were used within the window treatments. Then, in the 1960s and 1970s, fabric designs became considerably bolder with larger patterns and brighter colors. Today, new neutrals being used consist of colors like charcoal and slate. The style you choose should be based on what room the windows are in, where sunlight filters into the room and at what time, their shape, and the statement one wants to make. Whether you are looking for a unique solution or a traditional custom design, contact Austin Blind Faith for more information and to schedule your free in-home consultation! The history of Austin Blind Faith: Almost a century ago, there was a man named Val Hicks that sold equipment to make blinds and shades. He developed a unique friendship with one of his customers down in Corpus Christi, TX named Gus Gustafson. Val’s son, Ray, and Gus’s daughter, Priscilla, soon married and started their own blind manufacturing plant in 1980. Ray & Priscilla had a daughter, Darby who, after growing up in and around her parents’ business, decided to start her own window covering business and Austin Blind Faith was born. Darby runs Austin Blind Faith with the same dedication to outstanding customer service and high-quality products.